Spending 3 months in Taipei, Taiwan, we had a lot of time on our hands. If were weren’t hiking up Yangmingshan or hanging out in one of Taipei’s beautiful parks, we were eating. Taipei has had some of the best food of our travels. The savory soup broths, the pork xiao long bao, the little fried rice restaurant next to our Airbnb, it was all so delicious. 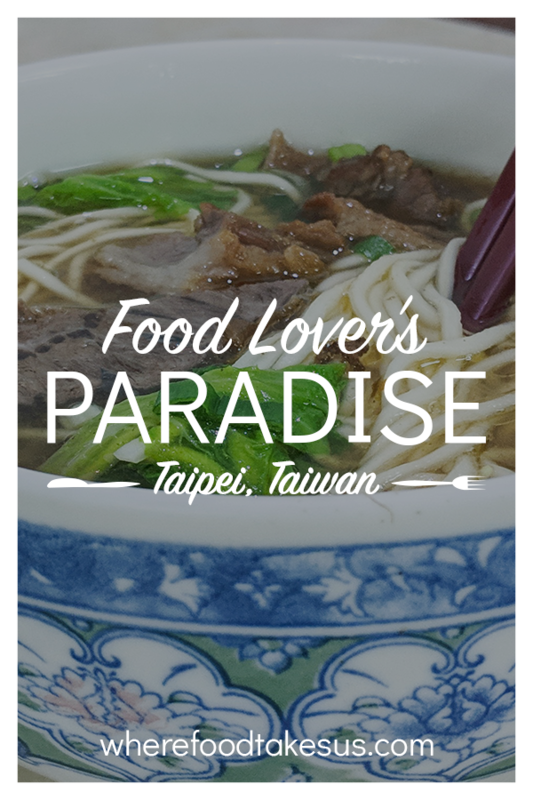 In this post we talk about some of the best food you can find in Taipei, Taiwan. 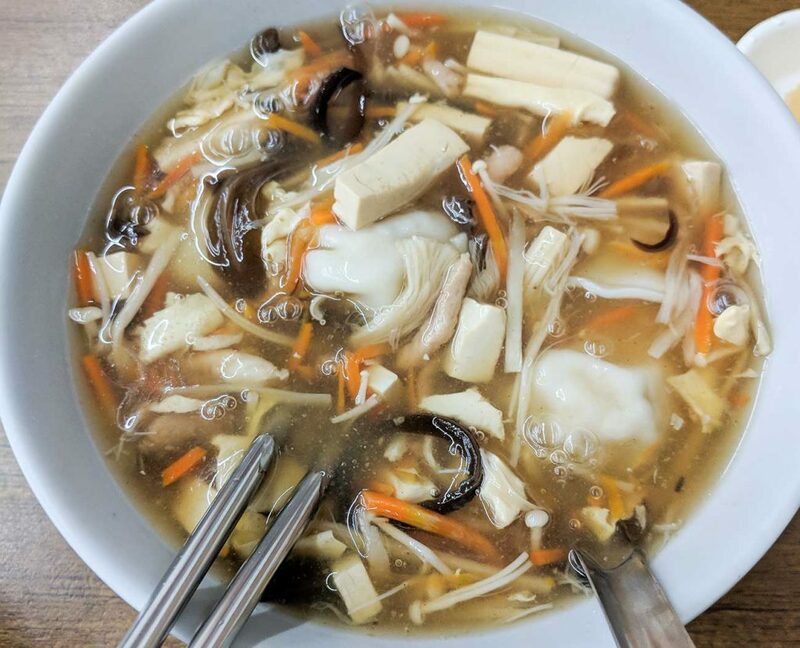 You can find this wonderful concoction in several places but our favorite is a small chain called Ba Fang Yun Ji. It’s scattered throughout Taipei and New Taipei City so you can’t miss it! Each restaurant is a little different but they have the same concept: dumplings and soup. You have a choice of hot and sour soup with mushrooms, carrots, and bits of pork or a creamy corn soup with carrot chunks. There’s no English on the order form but the menu has English translations under the Chinese characters! It just takes a little studying of Chinese characters and then you’re all set for a great meal. You can also order dumplings or potstickers without the soup. Cost: Soup with dumplings – $2 USD. Dumplings or potstickers – around $0.15 USD each. Whoa! Similar to the dumplings in our soup, but they are not the same! These pork-packed dumplings are filled with a hot broth. Dip the dumpling in a mixture of vinegar and soy sauce, place it on your spoon and poke a hole in the xiao long bao with your chopstick. Let the broth fill your spoon and then voila! Don’t forget to throw some ginger on top. xiao long bao is hands down the best food in Taipei. At least most of the time, depending on our appetite! You can find these at any night market or most soy milk restaurants; however, we recommend trying it at Din Tai Fung. 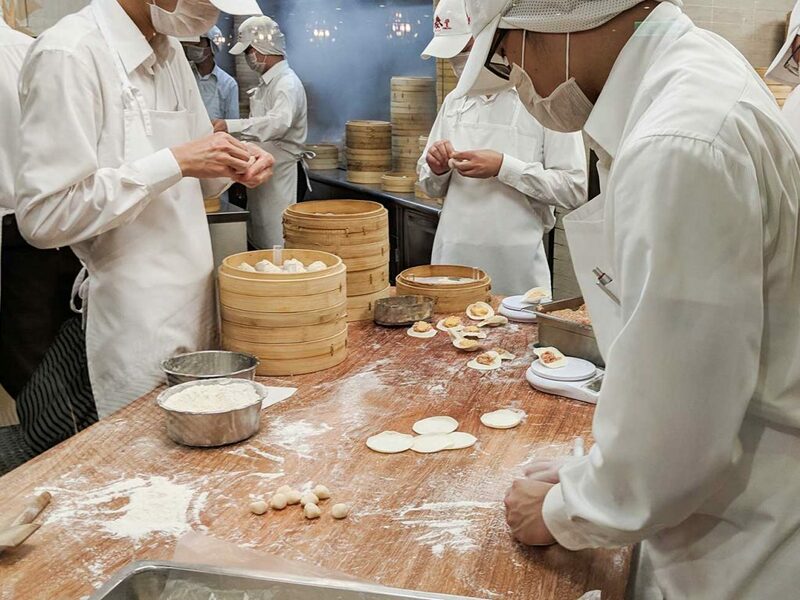 Originating in Taiwan, it’s now a multi-national chain, but that doesn’t take away from the awesomeness that is Din Tai Fung. Let’s just say that the xiao long bao is so good that there wasn’t enough time to snap a picture of them once they arrived at our table. They even have a card for you with directions on how to properly eat the dumplings. Don’t worry if you don’t follow the directions, it’s just a useful guide. You can also watch from the window as they hand make the dumplings. It’s a very efficient process! There are multiple locations across Taipei. Cost: Night market xiao long bao – around $0.10 USD each. 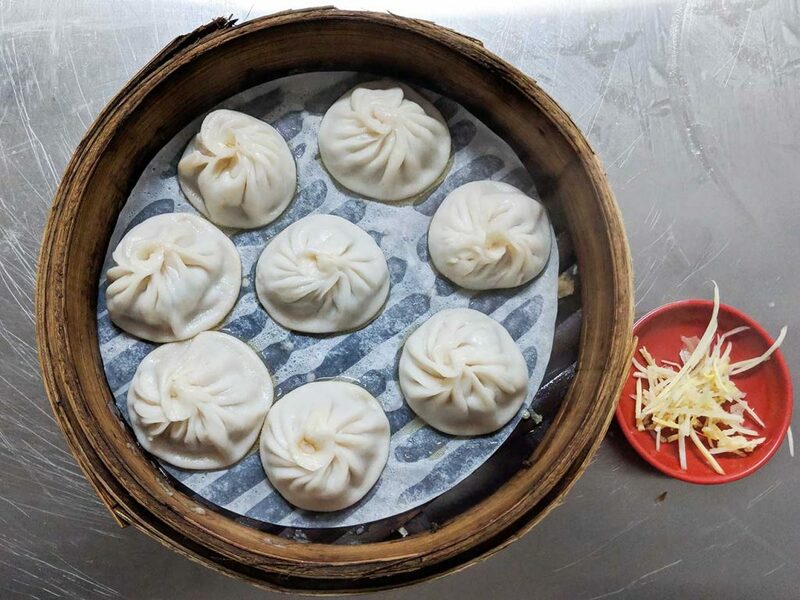 Din Tai Fung xiao long bao – around $0.50 USD each. This little foodie delight is a very cheap but delicious snack. All night markets had this as did soy milk restaurants. 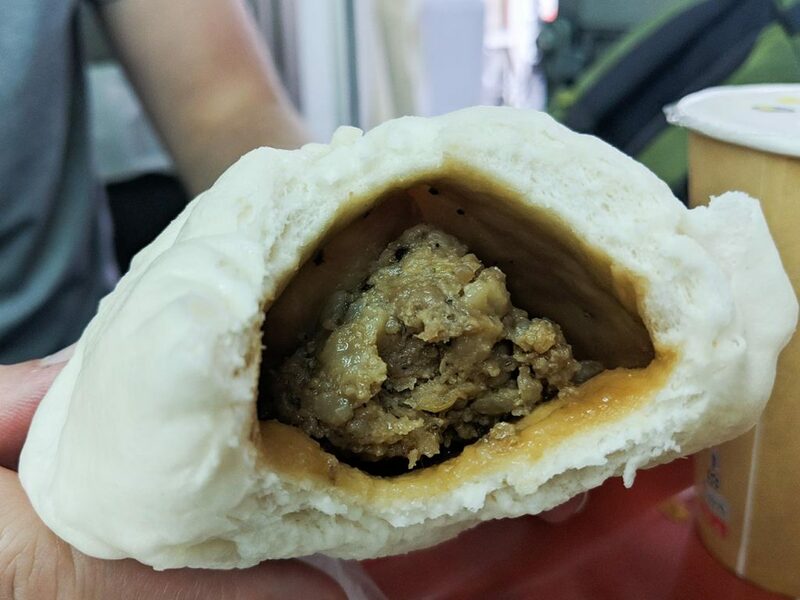 It’s exactly what the name implies, a steamed bun filled with a huge pork ball. The pork makes the inside juicy and it just melts in your mouth. Probably some of the cheapest Taiwanese food you’ll find in Taipei. We’ve got a whole post on the best soy milk restaurants in Taipei so be sure to check it out! We just wanted to mention it again here because seriously, it’s some of the best food you can find in Taipei. 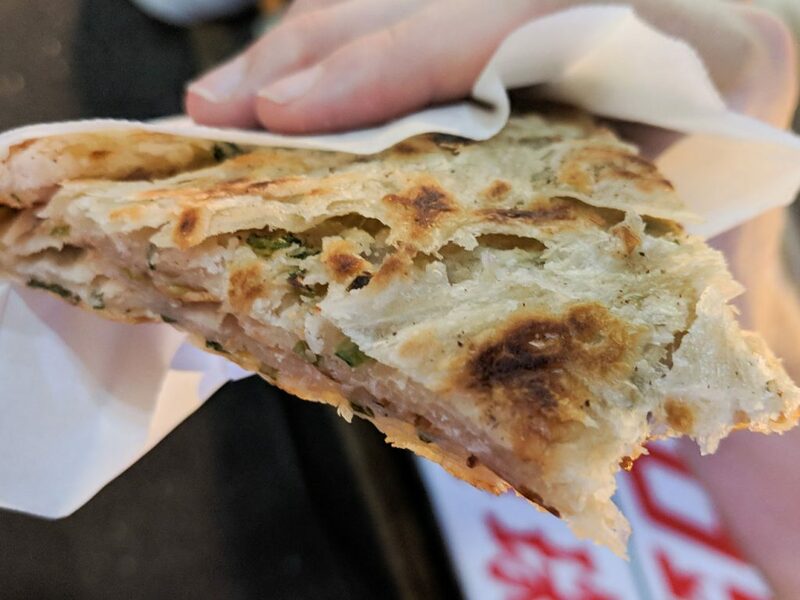 This is one of our favorite foods from the night markets in Taipei! 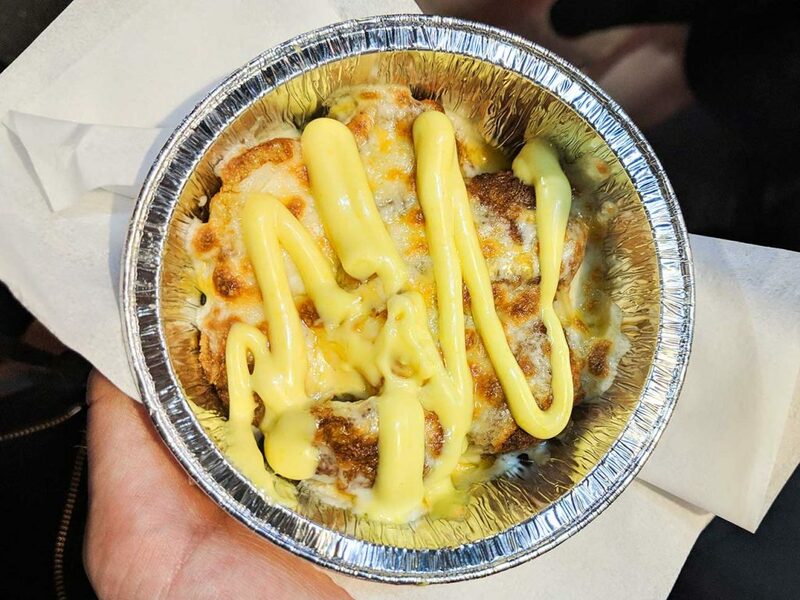 We couldn’t find it at every night market so check out our post on the best night markets in Taipei to see where you can find it! Again, this is just what the name implies. 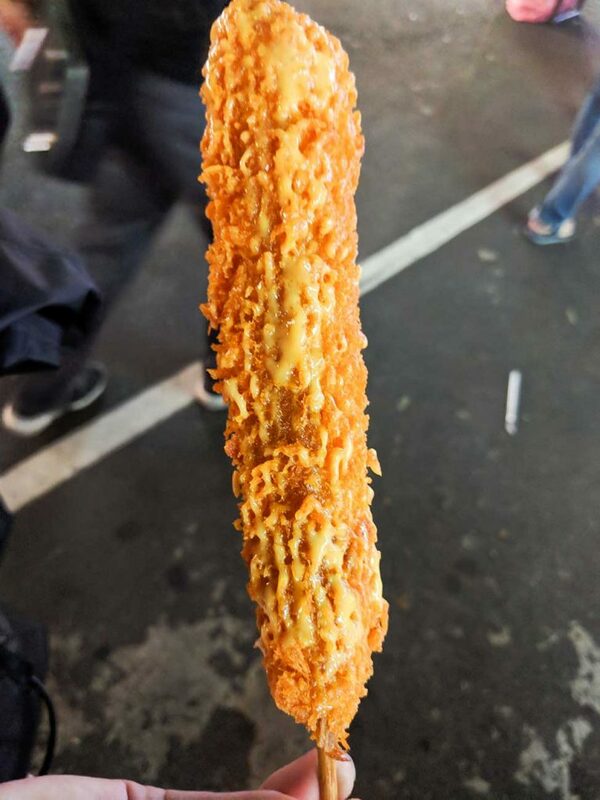 A huge, breaded block of shrimp and cheese on a stick that’s been deep fried. They have a choice of sauces to put on top and we chose more cheese, of course! This was one of our foodie staples in Taiwan and one of the best foods in the night markets in Taipei. You can find it anywhere, even at random food stalls on a random street (there are many of those!). The omelette is chewy but not overly so. You have a choice of sauces and we went with the sweet soy every time. There’s a spicy option as well. We hadn’t tried hot pot before Taiwan and most of the places are very expensive compared to most restaurants in Taipei. But it’s good to splurge on food, right? That’s what we tell ourselves, anyway. Having been recommended by some fellow travelers to try a place called Mala Hot Pot, we’re going to do the same for you. This place was awesome! 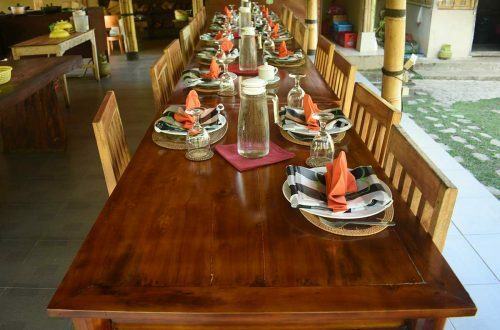 You pay around $20 USD per person and have two hours to eat all you can. The timer starts when they seat you and you’re on the clock! 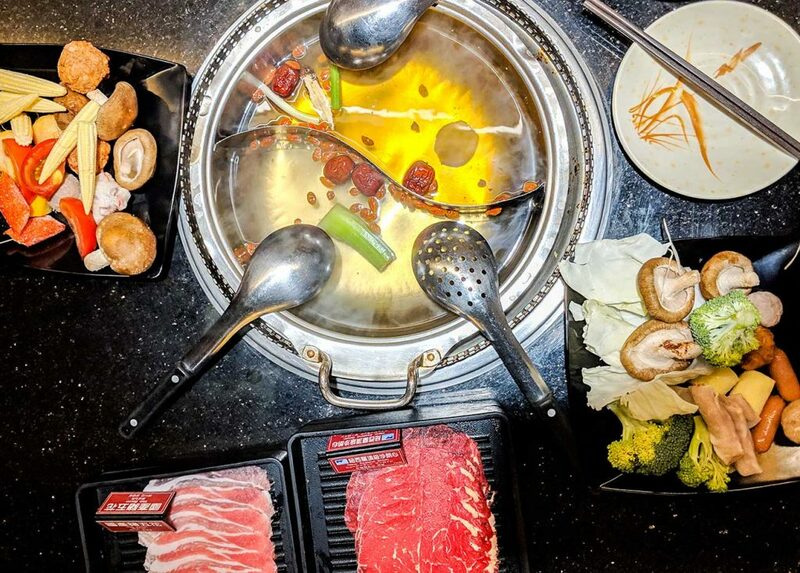 Choose your broth, choose your meat, and then head to the buffet where you’ll find all types of add-ons like veggies, pork, and fish. There’s all you can drink wine (depending the location) and Taiwan beer as well. But now for the best part, which has nothing to do with Taiwanese food but it makes Mala Hot Pot an amazing restaurant: all you can eat Häagen-Dazs ice cream! Enough said. Another night market gem, this was the first food we tried at a night market in Taipei. We didn’t speak any Chinese. We couldn’t read anything. It was overwhelming. But then we saw a guy using a blow torch and we needed to know more. When we approached we saw that he was melting a mountain of cheese on top of a bed of fried chicken with the blow torch. That was an easy decision for us. So began the foodie adventure. 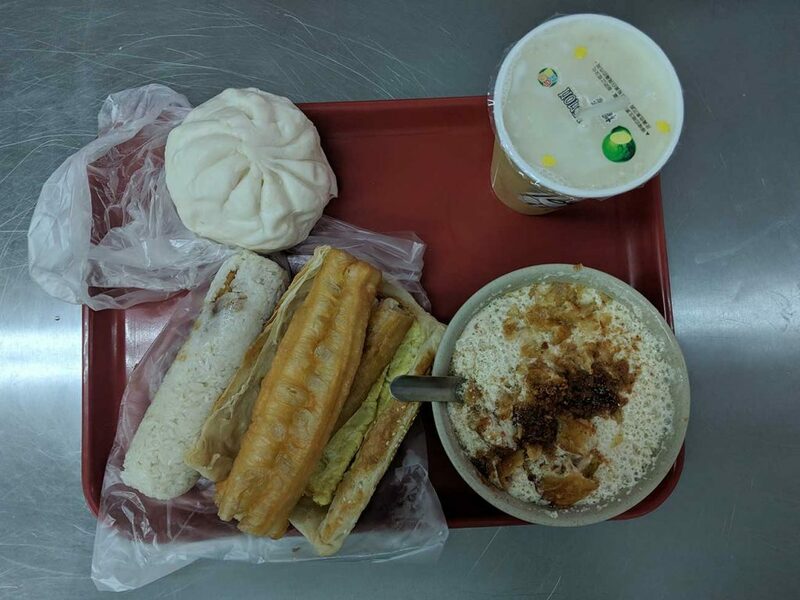 This is a very popular dish in Taipei and we tried Si Fang a Jiu Minced Pork Rice near Longshan Temple. This turned out to be a win-win since there’s also a night market on the same street. 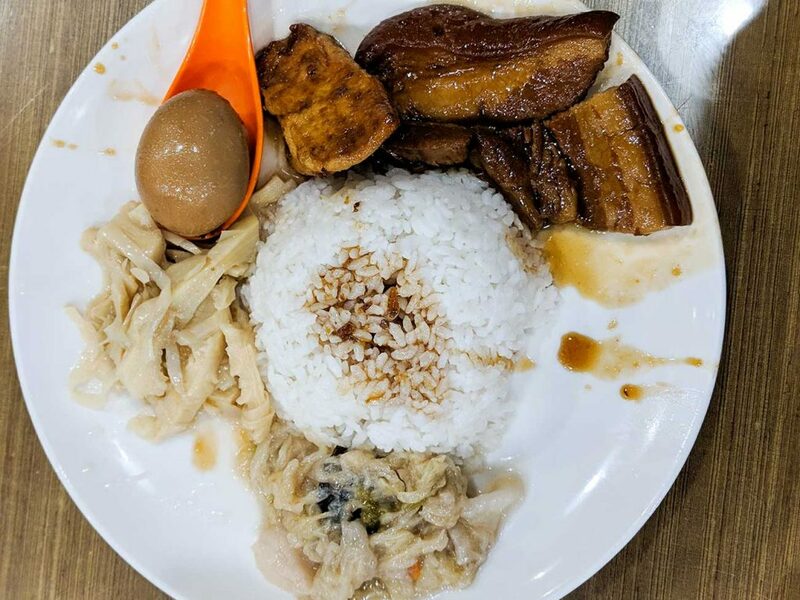 The braised pork is very tender and you’re given plenty of rice, as well as stewed cabbage and a soy-soaked boiled egg. We highly recommend trying braised pork rice if you’re in Taipei. Jin Feng Braised Pork Rice is supposedly the best in Taipei but we haven’t been able to confirm this. 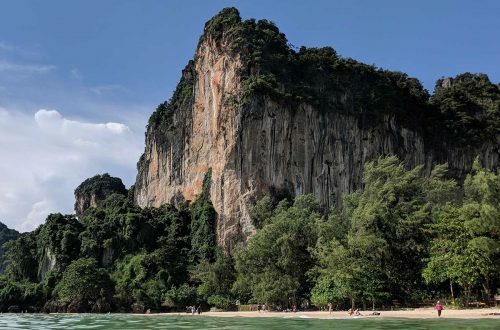 We’ll have to when we return! 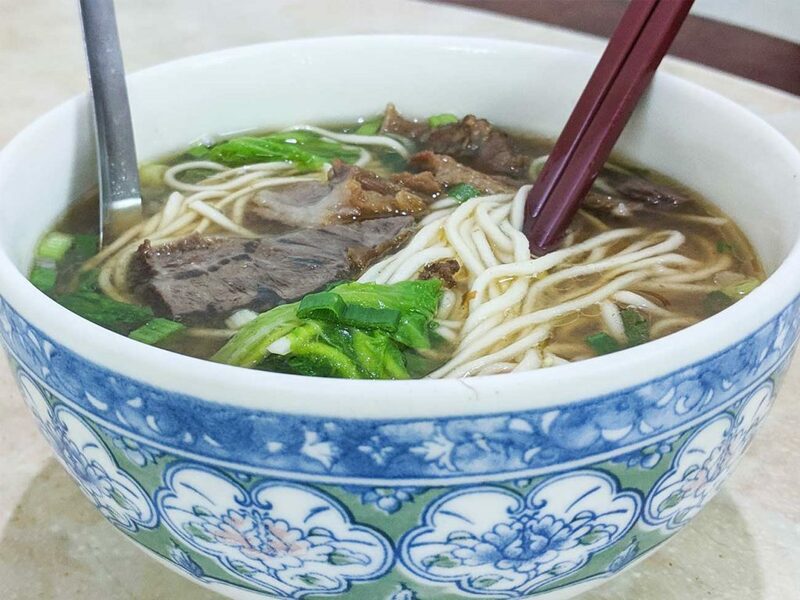 Another staple of street vendors in Taipei, beef noodle soup is commonplace. But not all places are the same. The best beef noodle soup was downstairs from our Airbnb. Yes, downstairs! How cool is that? Some of the best food in Taipei was just steps away. We stayed in New Taipei City because the cost for an Airbnb was much cheaper. We were the only foreigners in our area but we weren’t treated like it. Beef noodle soup opened for dinner and stayed open until about 1 am. The late hours were awesome since we taught English online until 9 pm, but it also helped that a big serving of beef noodle soup was dirt cheap. Cost: $2 USD per person. More street vendor food in Taipei. Are you seeing a pattern here? Taipei’s streets are filled with deliciousness. Like the beef noodle soup restaurant, this stand was steps from our apartment. It was the most American food we tried. Chicken or beef, onions, cheese, and mustard, it felt like something we’d find back home in the States. It was truly a street vendor masterpiece. 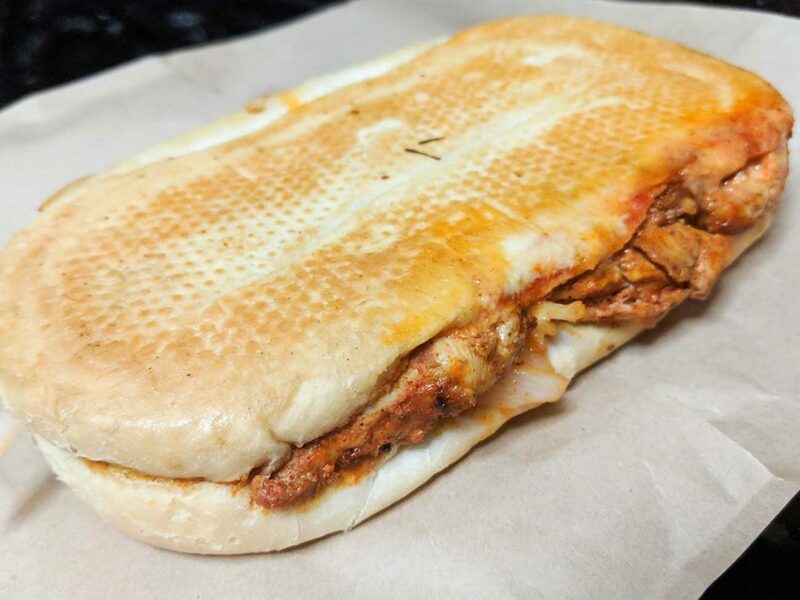 When we were settling in our Airbnb and learning how to order around our neighborhood, the Cuba Sandwich street vendor was our go-to. It’s run by a very kind couple who were so happy when we came to grab a sandwich. Cost: Around $3 for a beef sandwich. Less for chicken. Not to toot our own horn, but again, this restaurant was across the street from our apartment. So we had three amazing restaurants not even a minute walk away from our living room. Halo was one of those restaurants we were afraid to try. Yes, the name Halo is English, but that was it. Nothing else was in English. So we walked up one day and just started checking random things on the order sheet. Turns out we’re really good at guessing. 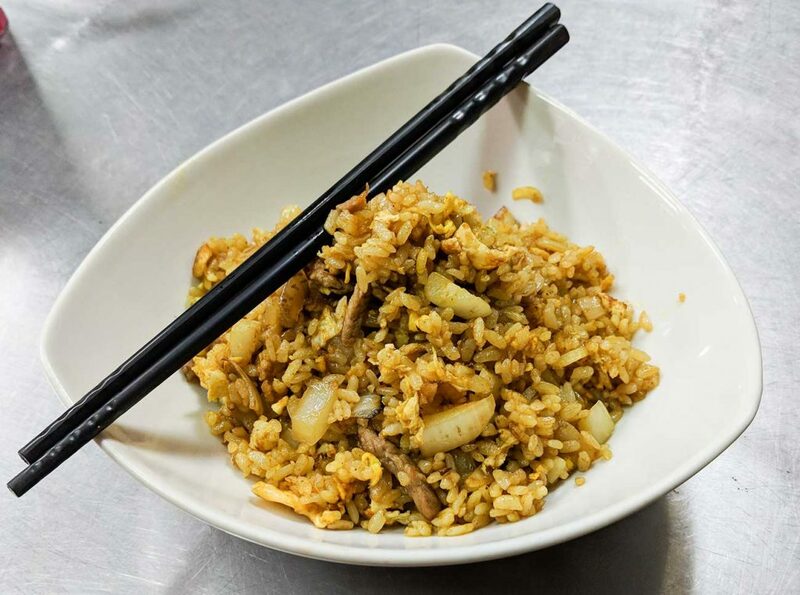 Fried rice, fish soup, greens with pork, the list goes on. The hard working crew also gave us some free dishes. They were very kind and seemed happy to have foreigners eating there. Needless to say, we went back many times. You can find bird eggs at every night market and they are exactly what they sound like. We’re not sure which birds these eggs come from but they’re teeny tiny and delicious. We’ve tried them two ways but they were more or less cooked the same way. The eggs are cracked into a large griddle with rows of small round indentations that perfectly hold the contents of the eggs. As the eggs cook they’re turned within their little bowls so they come out looking round. 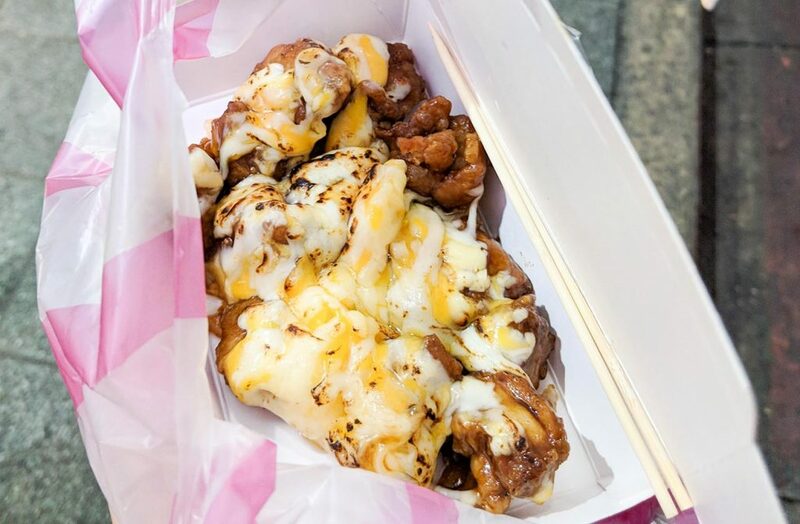 We’ve tried them on a stick with soy sauce and in a small pan covered in melted cheese and drizzled with a honey mustard sauce (pictured above). We read about Gua Bao and immediately knew we had to try it. It’s a steamed bun stuffed with braised pork belly, pickled mustard greens and topped with crushed peanuts and cilantro. We can’t tell you how much we love this treat known as the Taiwanese hamburger. 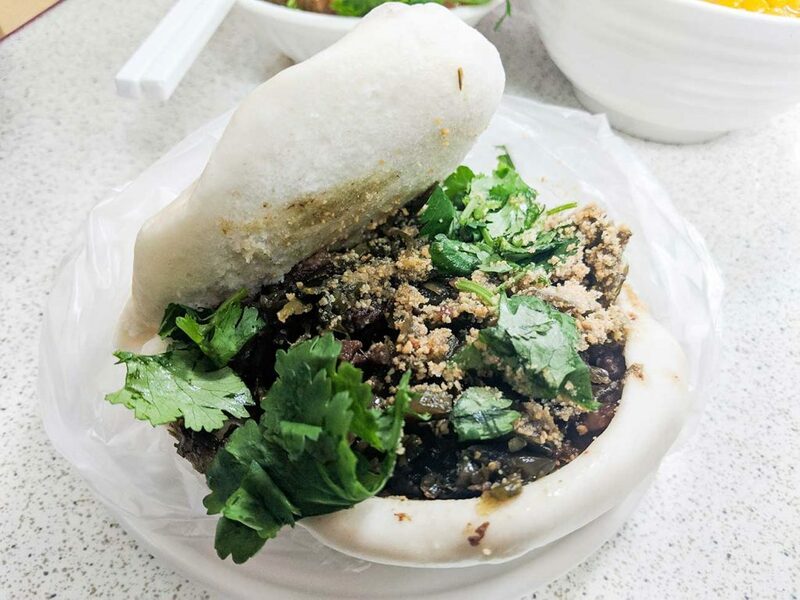 The best place to get Gua Bao is at Lan Jia Gua Bao, the first Gua Bao establishment. 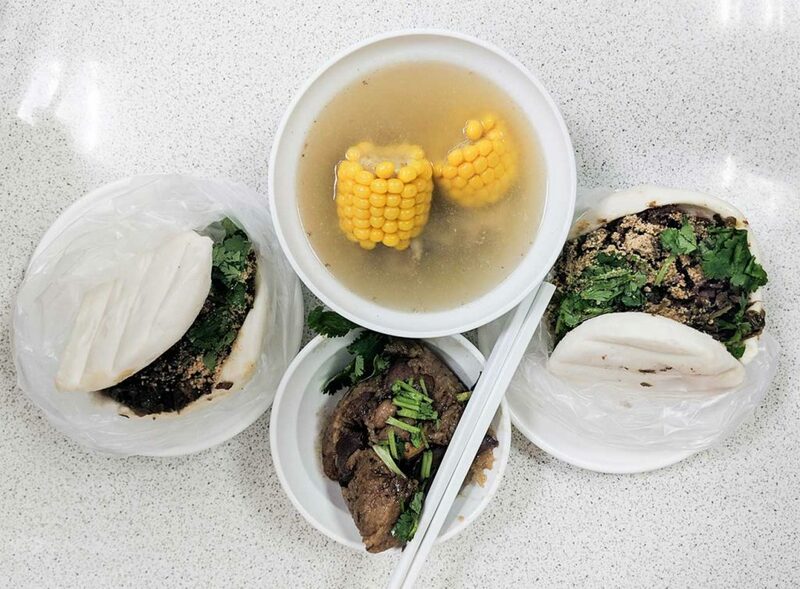 The owner is a self-taught English speaker who will help you order from his menu but to point you in the right direction we recommend you order your Gua Bao with half fatty, half lean meat and a bowl of corn spare ribs soup or sticky pork rice (rice tamale on the English menu). You can’t go to Taiwan without trying some Bubble Milk Tea. That’s because Taiwan is the birthplace of this delicious drink. Let me paint you a food picture, imagine a cup of half black tea and half milk sweetened to your liking. Now dump some black tapioca balls that had been stewing in brown sugar and you’ve got a heavenly drink. 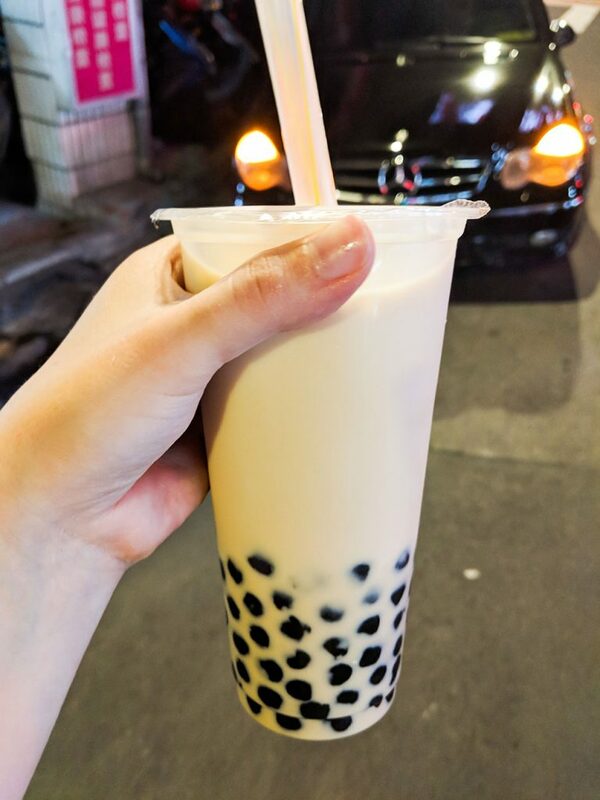 You can find bubble milk tea all over Taipei and it’s the perfect drink on a hot day. Taipei has some of the best food we’ve tried since being abroad and is also one of the cheapest foodie destinations. 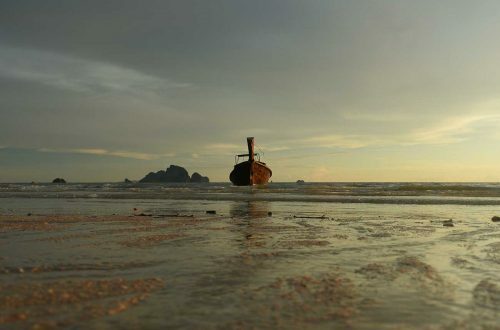 It’s no wonder that we miss it so much. However, it needs mentioning that while the food is so great, the friendly and welcoming people of Taiwan make it so much better. Go eat Taipei!